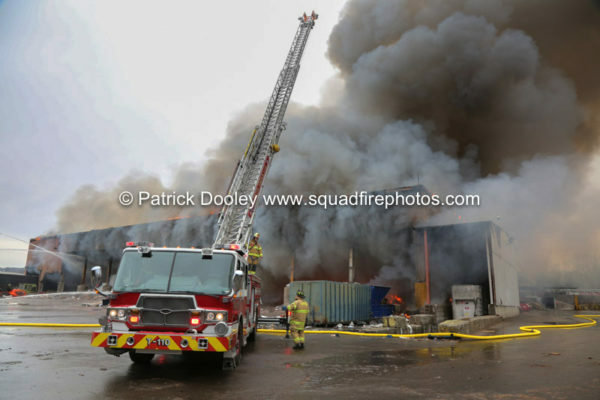 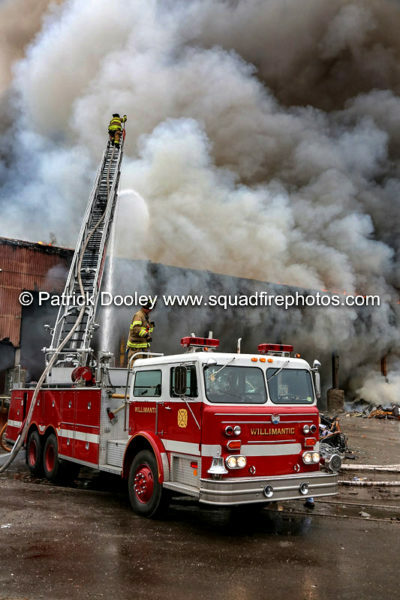 4-alarm Willimantic Waste Paper 1590 W. Main St.
01/28/18 Willimantic, CT – One of the largest trash management companies in the state went up in flames Sunday morning (1/28/18), just after ten am. 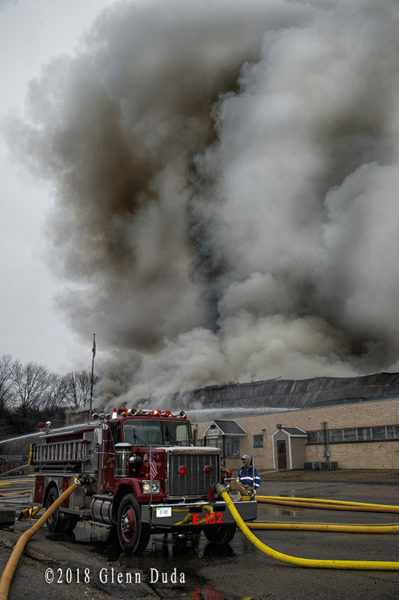 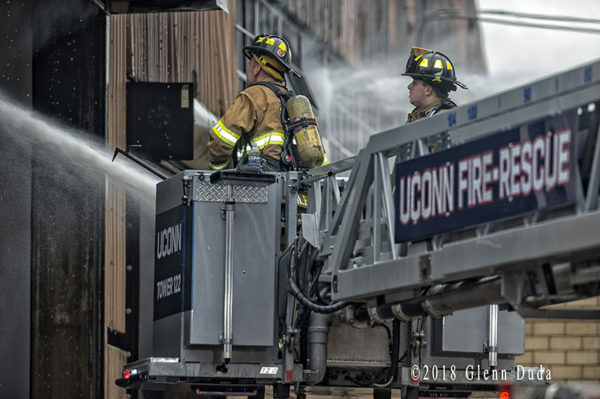 Willimantic firefighters found heavy fire inside the facility. 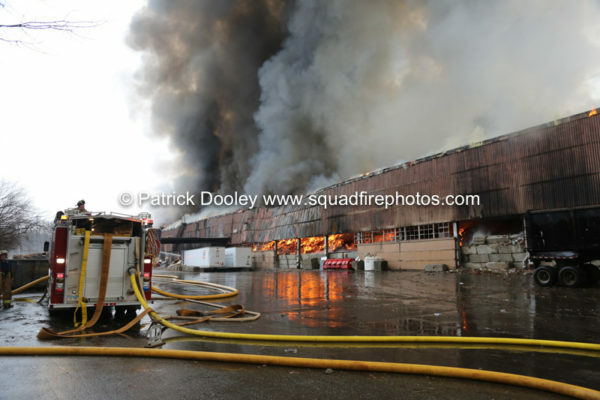 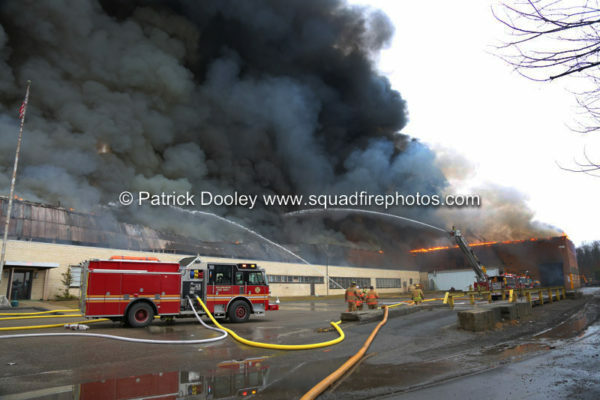 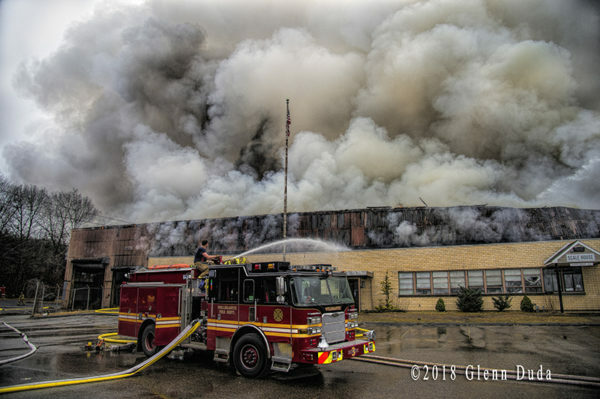 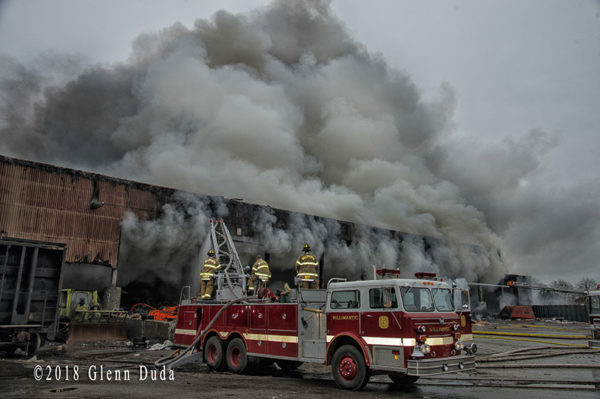 The fire quickly spread throughout the extremely large commercial building. 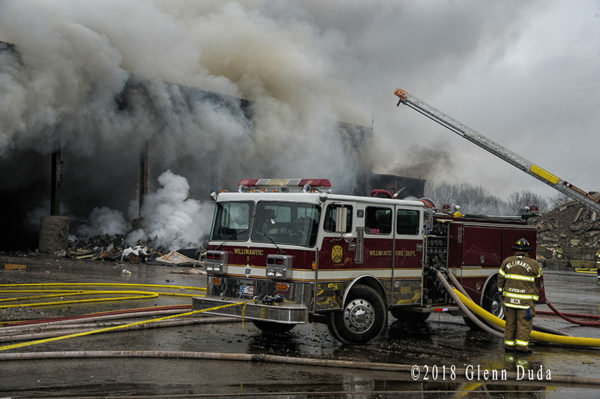 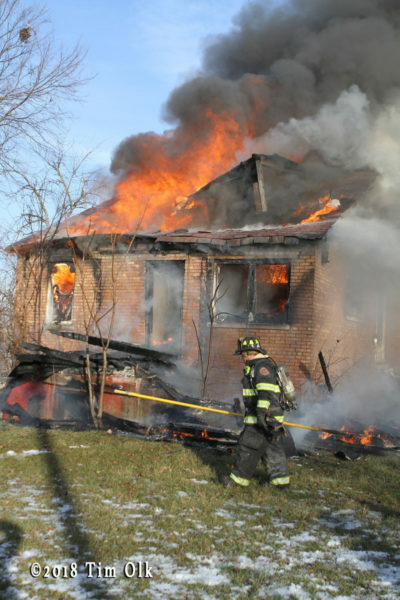 Additional alarms were quickly transmitted bringing fire departments from two counties. 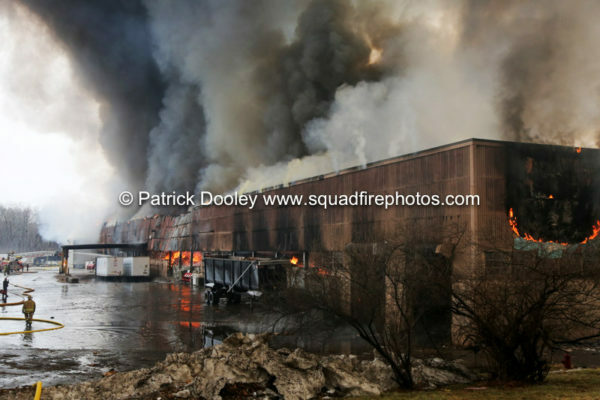 The fire burned for hours and could be seen for miles. 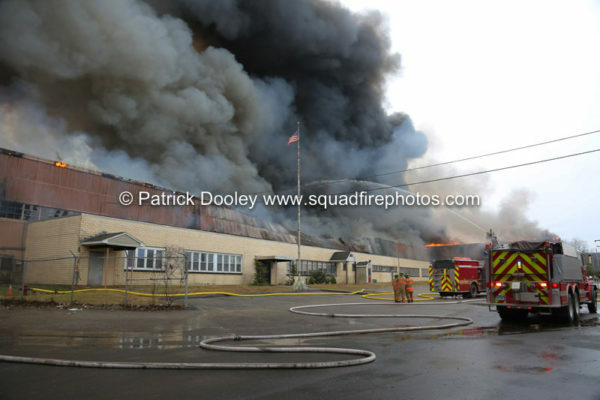 It burned throughout the night and into the next day when heavy equipment was brought in to dismantle the building. 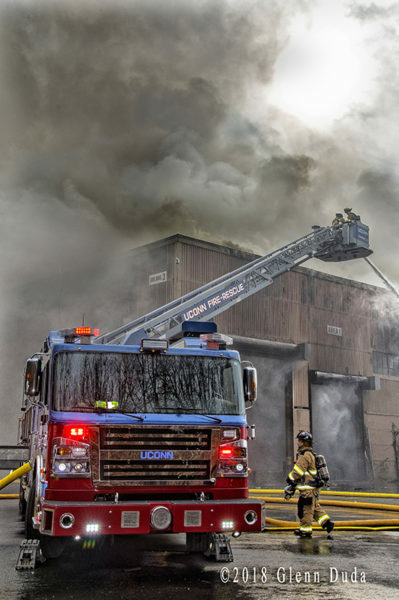 During the height of the blaze several collapses occurred prompting firefighters to setup additional master stream operations. 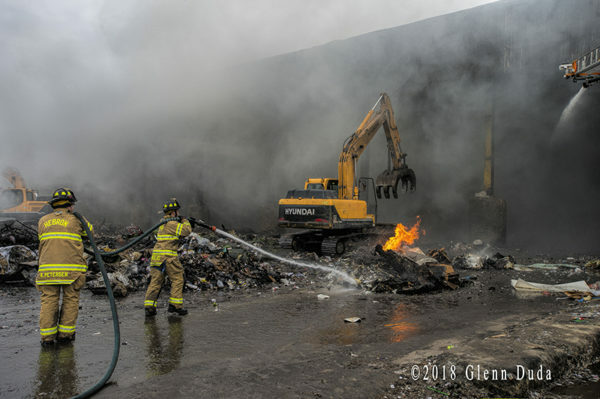 One heavy machinery operator was taken to the hospital for smoke inhalation. 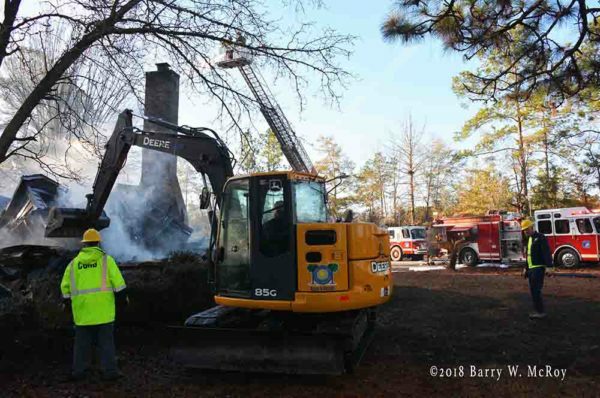 The cause of the fire is under investigation by the state fire marshal. 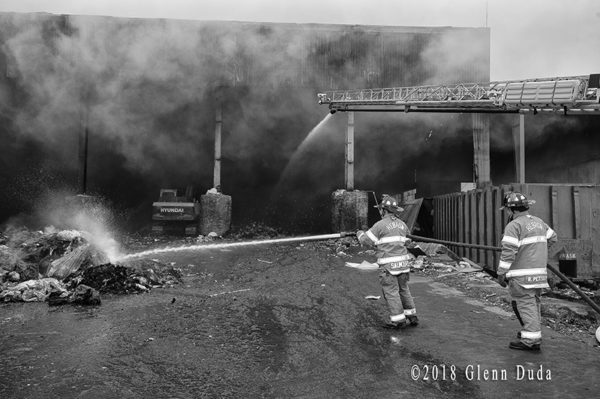 The DEP was also called to monitor air and runoff from the fire. 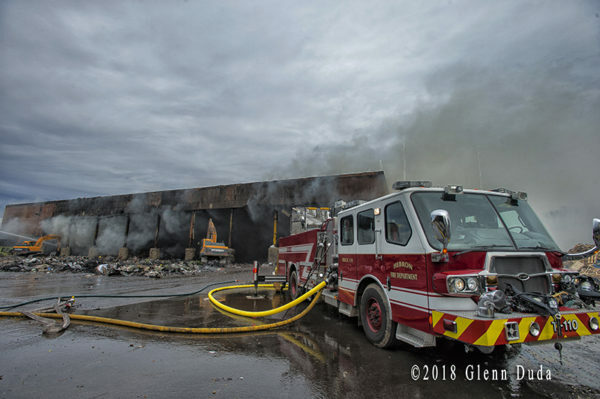 The business handles and recycles waste for businesses and residences throughout Eastern Connecticut. 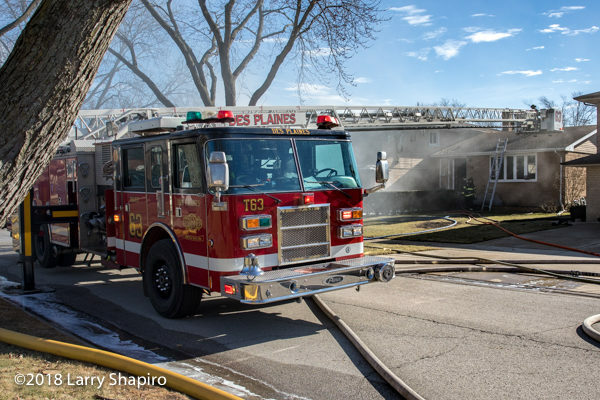 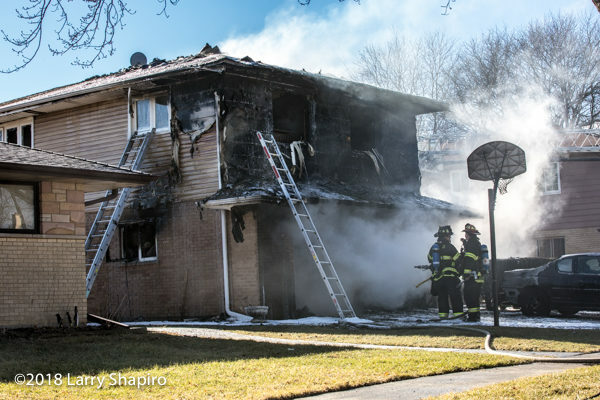 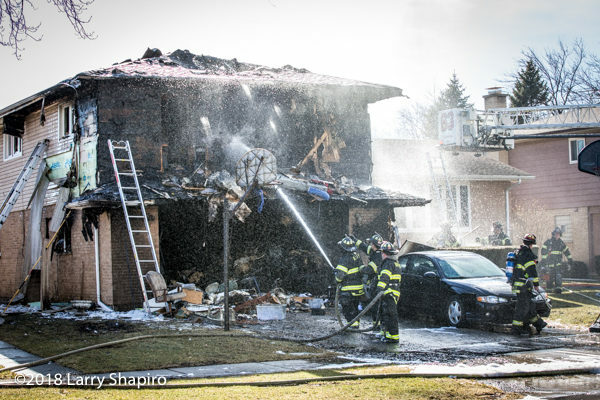 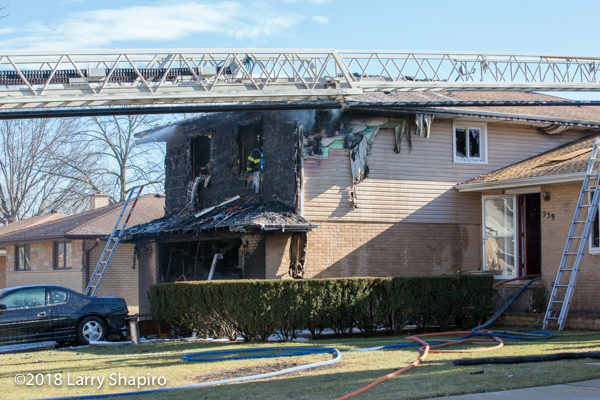 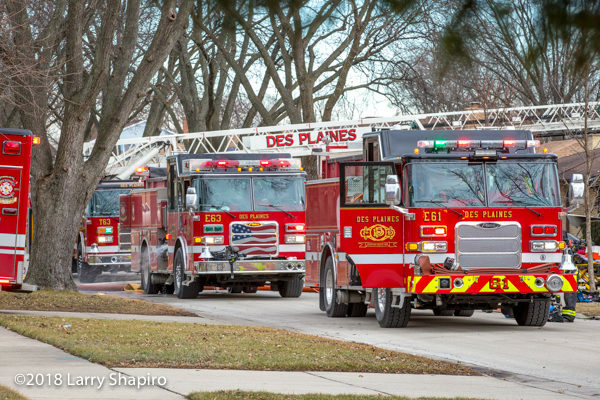 Des Plaines (IL) firefighters were called to 539 Westmere Road around 12:20PM on Friday (1/26/18) for reports of fire in an attached garage. 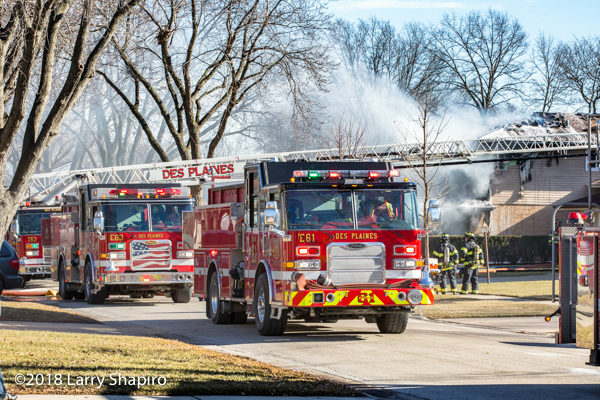 The initial call was followed by multiple 9-1-1 calls. 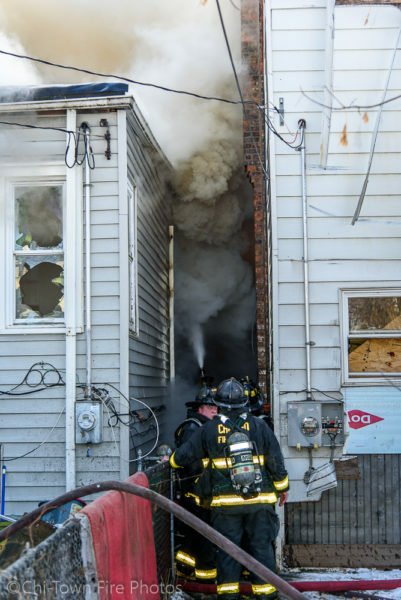 Engine 63 arrived first and reported heavy fire from the attached garage that spread into the second floor of the split-level house. 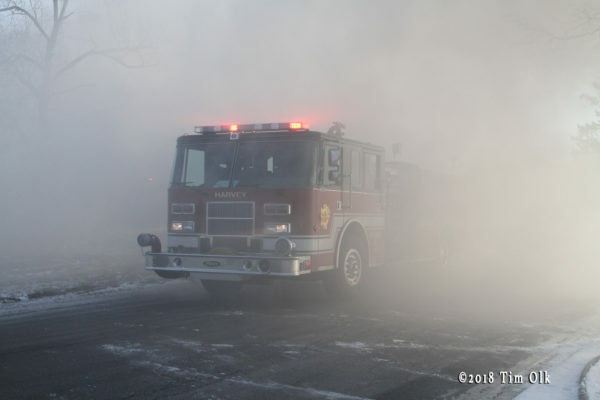 Strong winds blew smoke across the street obscuring visibility on the street. 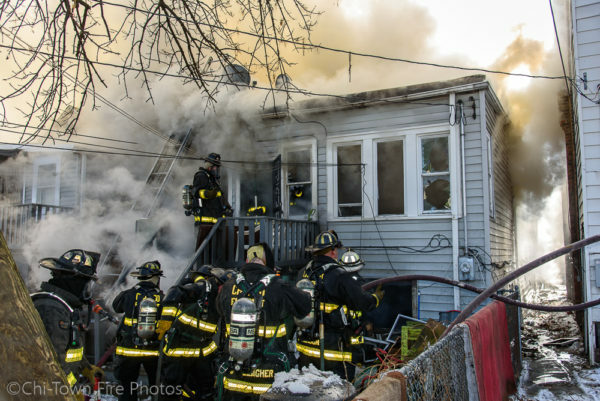 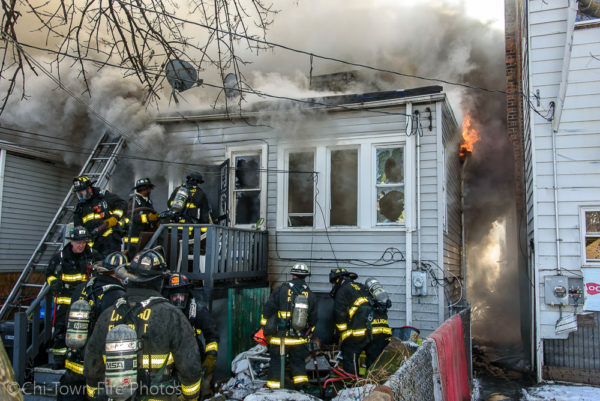 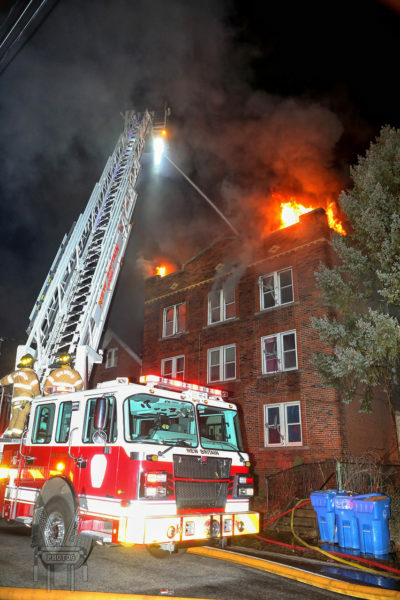 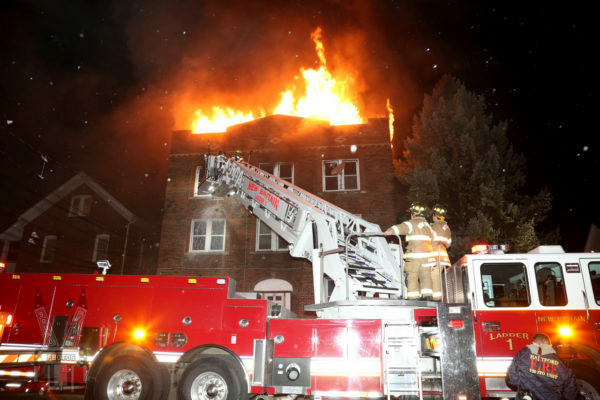 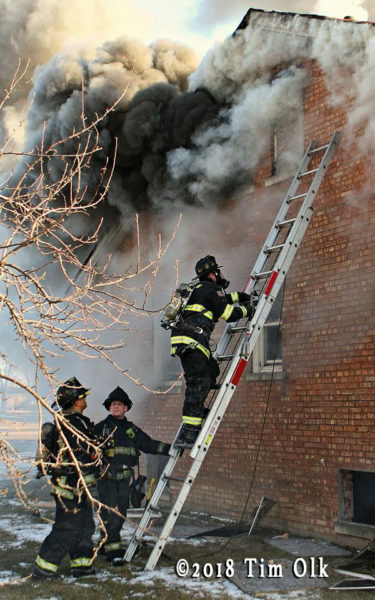 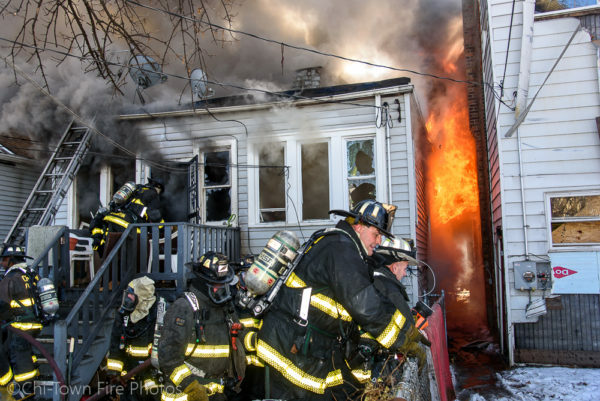 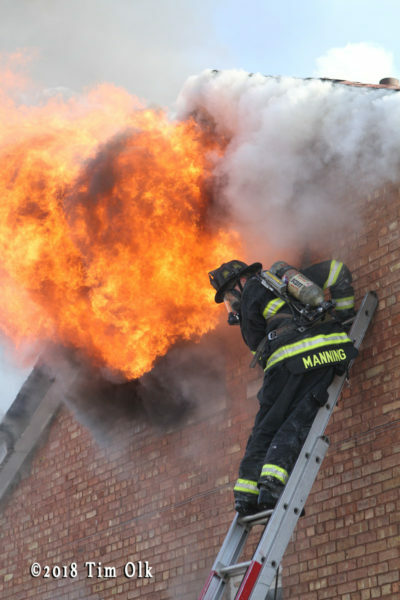 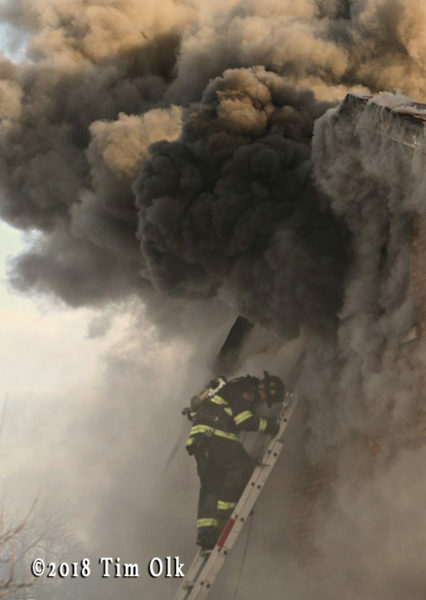 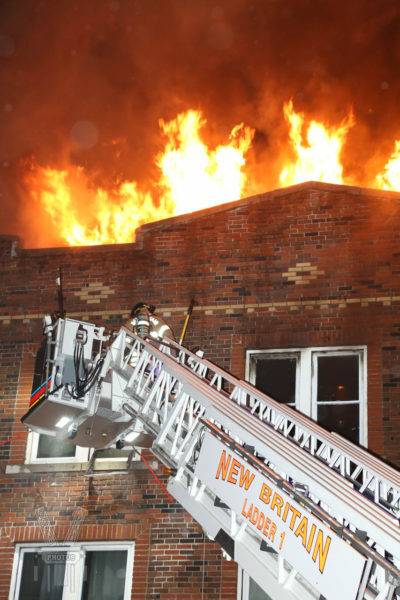 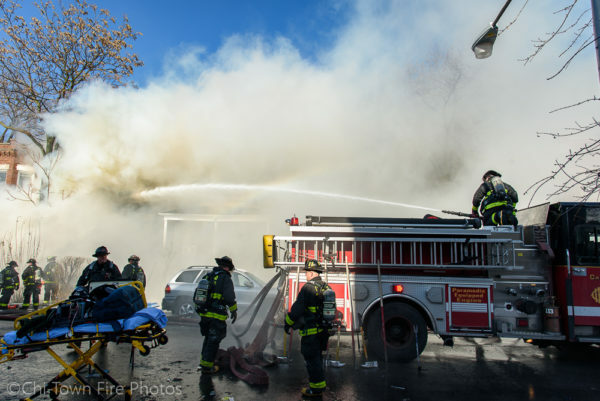 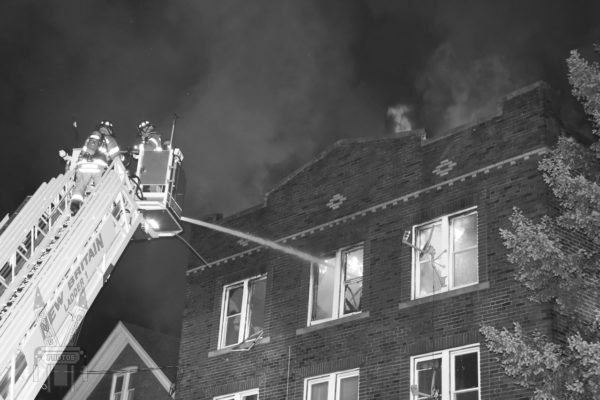 The fire was too intense to make entry so an exterior line was used with foam to make an initial attack and Tower Ladder 63 was setup to the roof for ventilation. 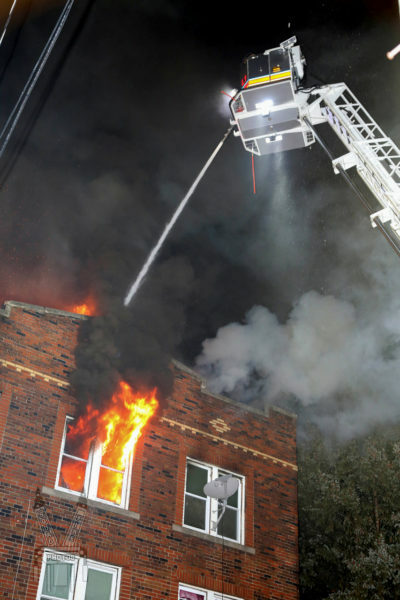 Four lines were used and the fire was knocked down within 20 minutes. 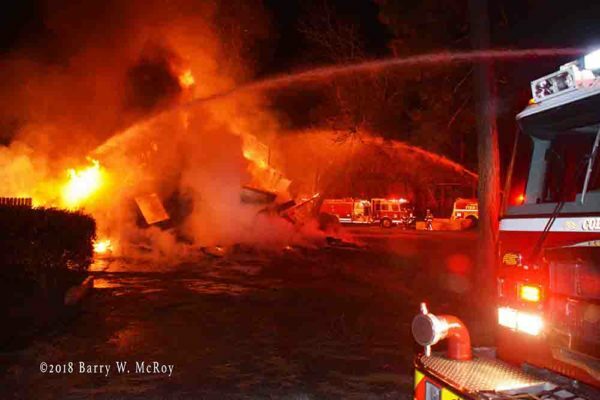 A Colleton County (SC) home was destroyed in an early morning fire Wednesday 24-January. 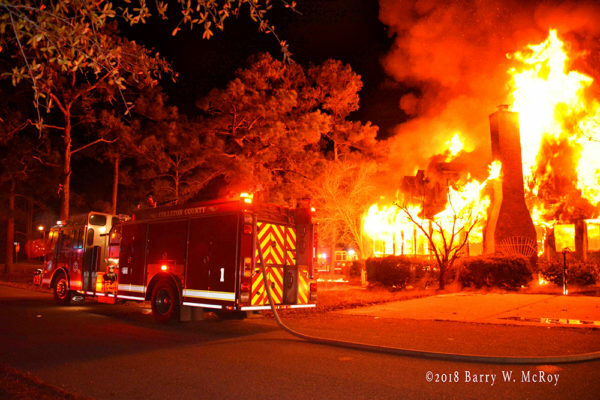 At 04:08, a caller to 9-1-1 reported seeing flames coming from the roof and hearing glass breaking in the two-story, residential structure, located at 262 Lakewood Drive. 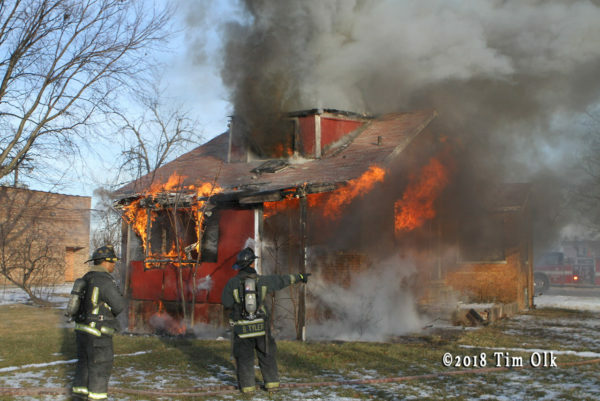 Firefighters arrived minutes later to find the home fully involved. 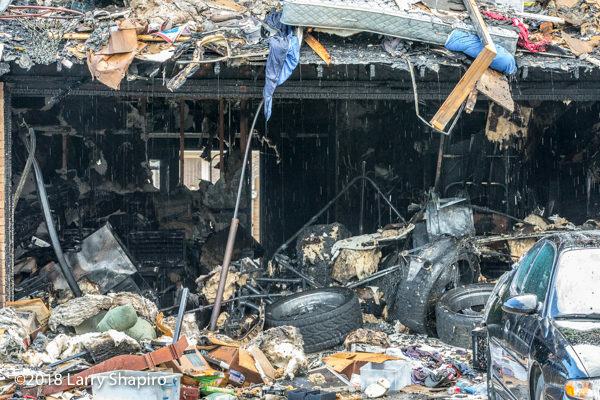 It had been burning for some time before anyone discovered the fire. 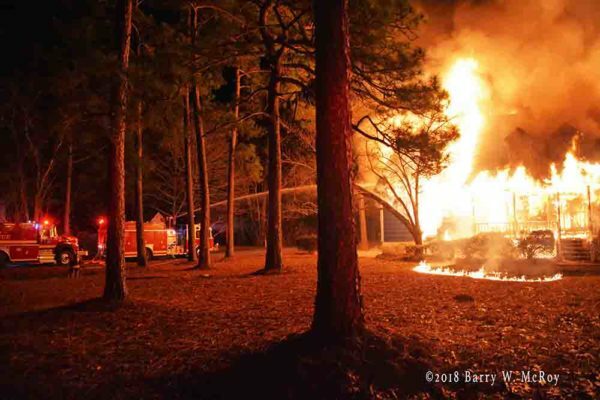 The home was located in the back of the subdivision on the corner of Lakewood Dr and Sangaree Rd. 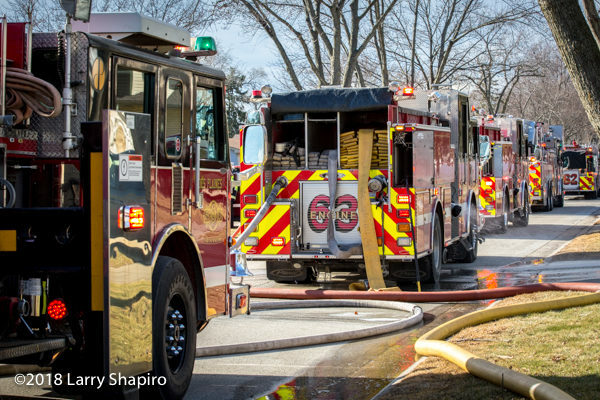 Engine 19 set up on Sangaree while Engine 26 set up on Lakewood. 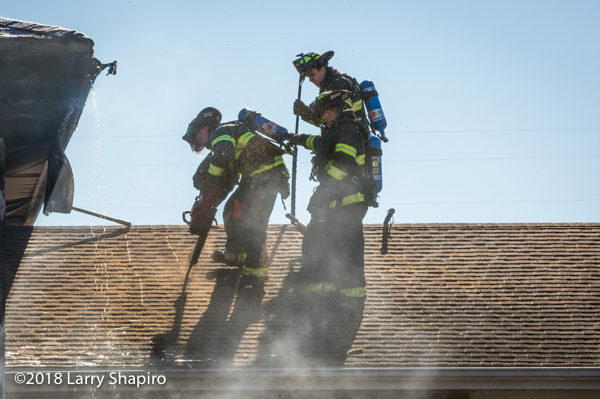 Both units used deckguns on the fire and deployed multiple handlines. 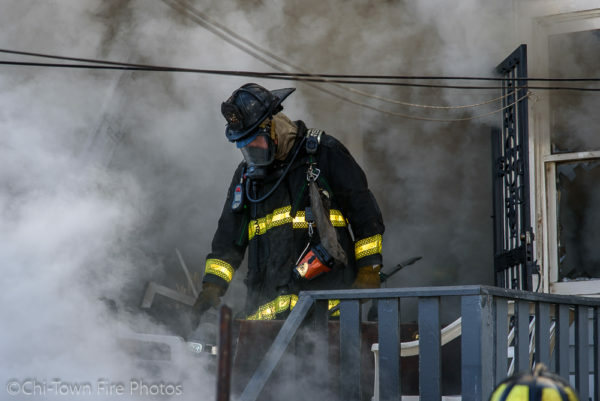 Engine 26 used a 3-inch line with a TFT Blitzfire master steam in the backyard, as well as two 1-3/4 handlines. 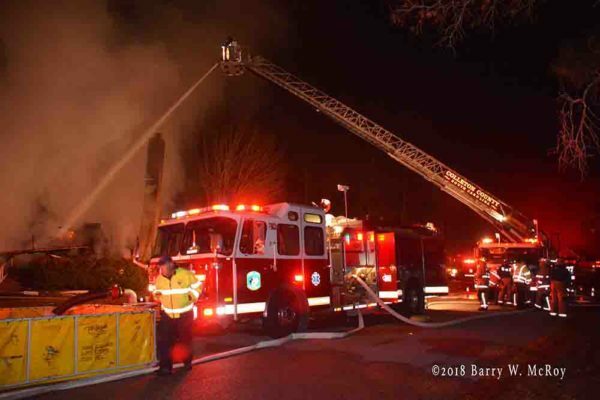 Engine 19 deployed two 1-3/4 handlines and one 2-1/2 handline to the north side of the structure. 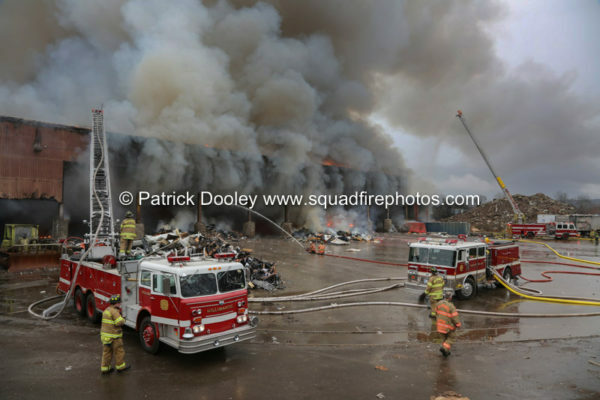 The entire building collapsed approximately 10 minutes after fire units arrived. 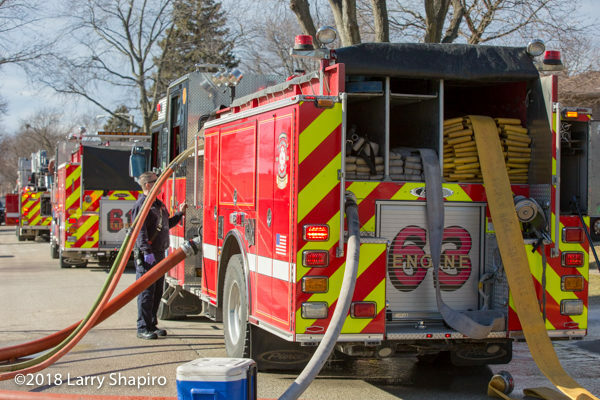 A tender shuttle was established to provide water supply to Engine 26. 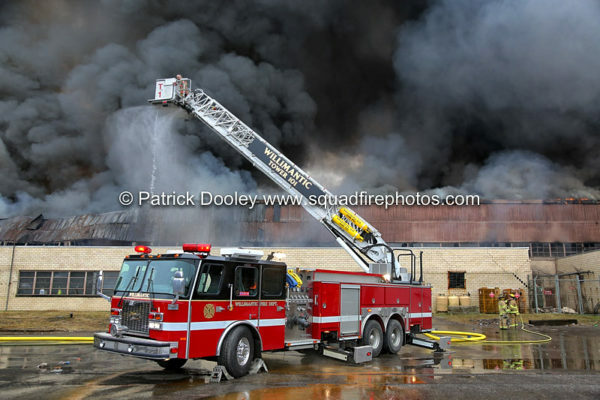 Tenders pumped truck to truck to supply Engine 19. 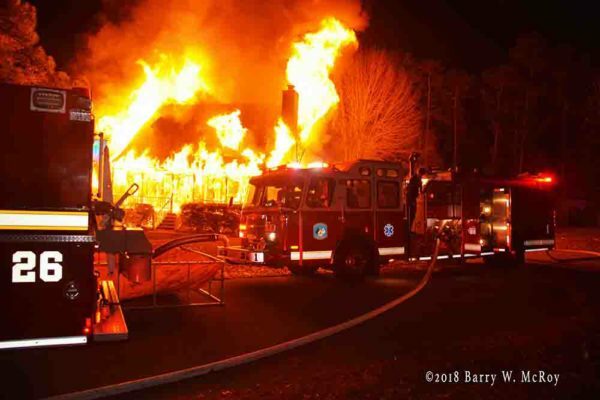 A second alarm was requested shortly after arrival for additional personnel and tenders. 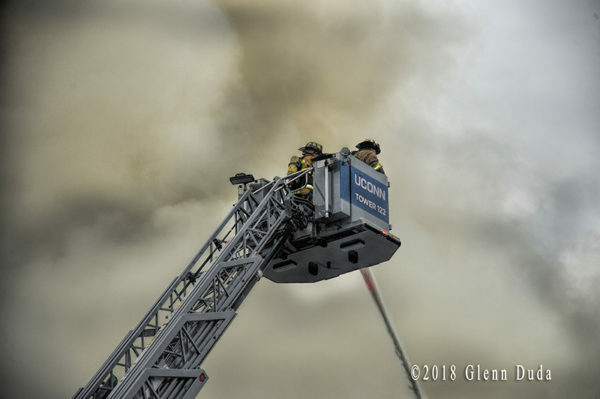 Ladder 19 setup behind Engine 26 on Lakewood Dr. 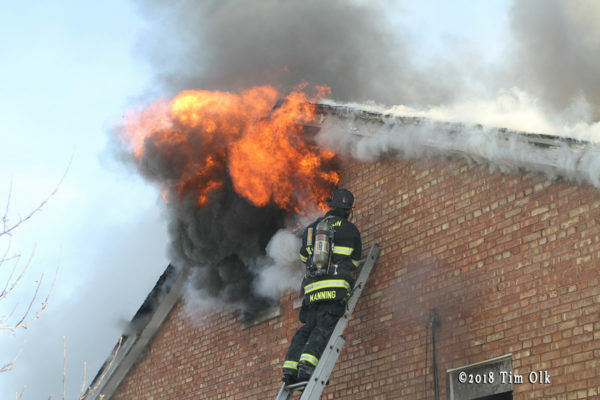 Firefighters worked for over an hour to bring the fire under control and were on the scene for six hours performing overhaul. 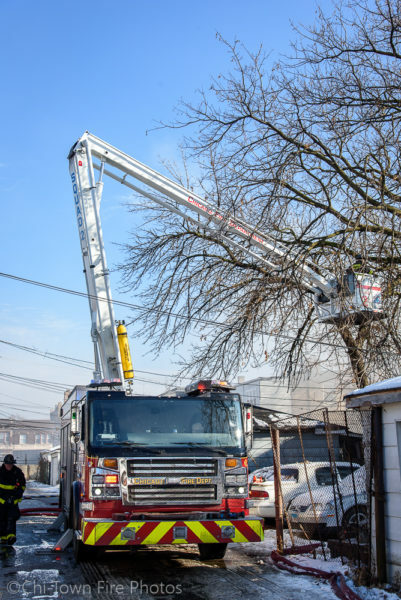 A small track hoe from the Roads and Bridges Department was brought in to assist firefighters in removing debris during overhaul operations. 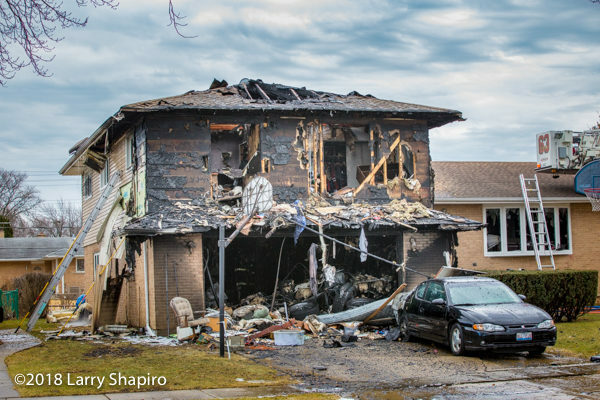 The home was being renovated and the cause appears to have been electrical in nature. 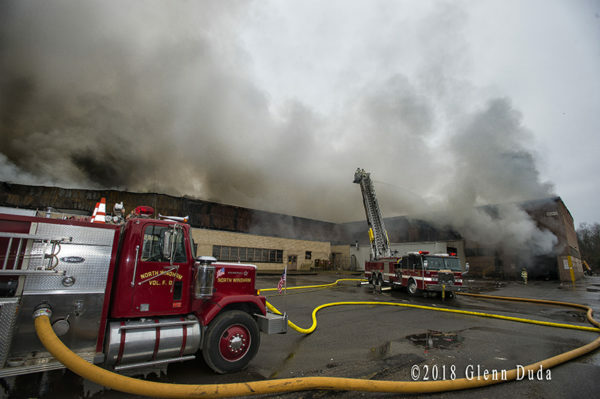 Engine 1, Engine 19, Engine 26, Tender 1, Tender 4, Tender 5, Tender 19, Tender 26, Tender 27, Ladder 19, Medic 1, Medic 13, Medic 19, Medic 26, Battalion 1, Car 105, Car 112, and Car 118 responded. 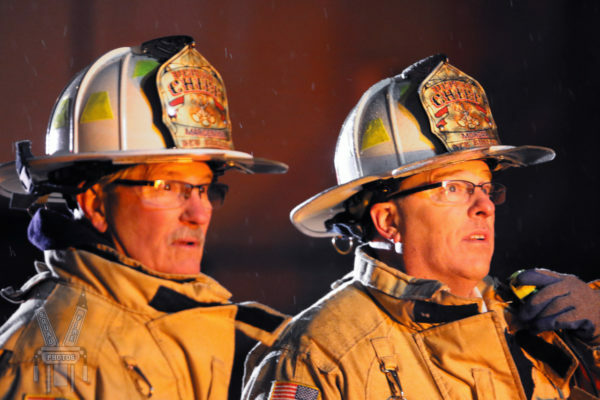 Battalion Chief Chris Jones served as incident commander. 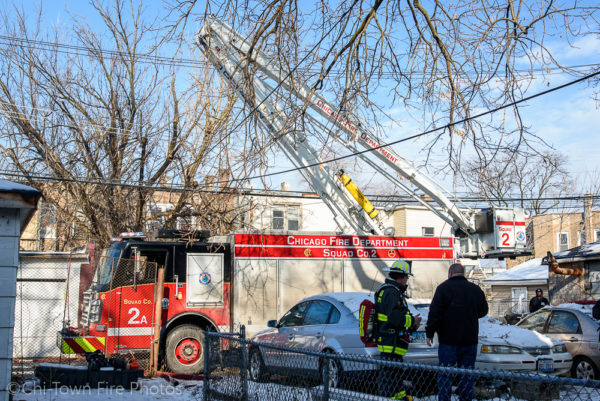 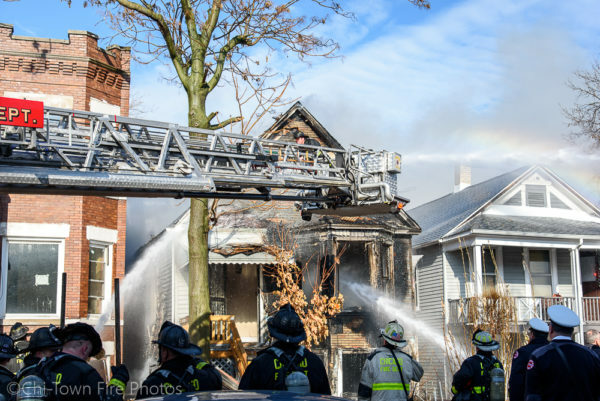 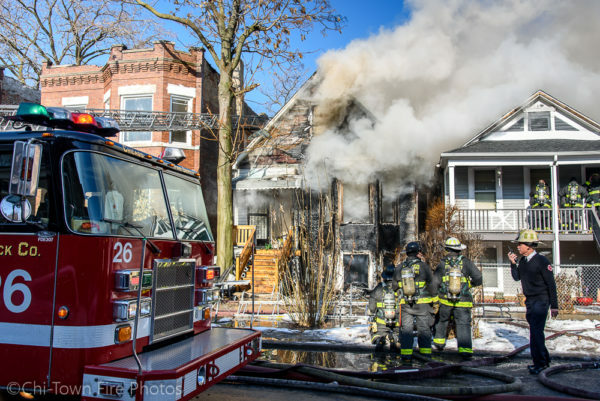 Chicago firefighters battled a Still & Box Alarm fire at 4828 W. Van Buren late Monday morning (1/8/18) that was upgraded to a 2-11 with an EMS Plan 1 for a Mayday alert.